So you might be asking "Who is Jessica Watson?" I've been following Jessica Watson's journey with great interest since it began this past October. At 16, this young lass from Sydney, Australia is endeavouring to become the youngest person to circumnavigate the globe in a sailboat, alone and unaided. She left the harbor in Sydney on October 17th 2009, headed on an easterly track that went north and back across the Equator. On January 14th Jessica rounded Cape Horn (her first sighting of land since taking off) at the southernmost tip of South America and began the Atlantic Ocean leg of her 23,000 nautical mile journey. Sometime today - if she hasn't already - Jessica Watson should be conquering Cape Agulhas on the southern tip of Africa and enter the Indian Ocean. Then once she gets to Australia she merely has to sail around Down Under and get back to Sydney. 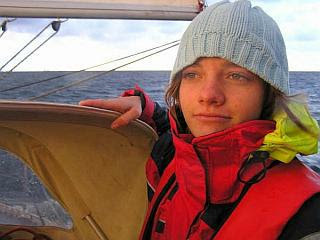 Visit Jessica Watson's official website for more information about her amazing odyssey, including a blog that she's maintaining on the trip and a page that uses Google Earth with GPS tracking that shows her present location and the track of her voyage thus far.